The film Interstellar has just been released and, from the trailers, the theme seems to be mankind’s need to move to another planet after screwing this one up. This seems to imply than mankind’s long term survival rests on being able to move from one planet to another like a plague of locusts and, rather than sorting out the root problem that we ourselves have created (overpopulation) we simply move on once we’ve exhausted/buggered up the local natural resources. A family of civet cats has moved into a pot on the balcony of our house. I suspect this is not simply opportunism but rather because good nesting sites in the surrounding forest are getting more scarce as the housing development in the area expands. I read about a similar thing happening in Penang where Hornbills (who normally nest in the nooks of trees) had started nesting in pots in people’s backyards instead. As our population grows, more and more of the forests are being cleared and the animals are losing their habitat and decreasing in number. In the case of tigers the situation is so dire that they are in real danger of becoming extinct in Malaysia. This is not just due to loss of habitat but also due to poaching which is providing the final nail in the head and threatens to reduce numbers of wild tigers to a level where they become unsustainable. Even in Taman Negara (Malaysia’s national park) tigers are in real trouble. No one knows exactly how many are left but the guess is around 80 tigers. Not many! You might think that the solution would be to breed tigers and introduce them into the park but this doesn’t really work as tigers needs a certain amount of space and their numbers hit a maximum level and stay there. I don’t know the exact number that Taman Negara can support but it isn’t that much higher than around 100 tigers. As more forest is felled to make way for palm oil plantations in Malaysia the amount of habitat for the wild animals diminishes and their numbers reduce accordingly to the point where what was once a relatively minor event (a tiger being poached) could have a catastrophic consequence by reducing the number left to a point where they die out. Here’s a question for you: which country has the highest number of tigers? The answer is America. Okay, it’s a trick question as those are captive or pet tigers, but one day soon they may be the only sort of tigers left. There is fascinating short film on the reintroduction of wolves to Yellowstone park and it demonstrates the fine balancing act that natures achieves. Here is the link: How wolves change rivers it is well worth watching. Here in Malaysia you can see a similar thing going on as the number of wild boar grow as the number of their natural predators reduce. 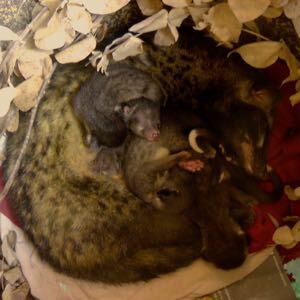 Anyway, all that is a bit depressing so here is some video footage of the civet cats to cheer us all up. With the GoPro Hero 2 there were other problems: there was no built in LCD screen (so you were never fully sure of what was in shot or not) and no way to playback what you just filmed (to check that you’d got the shot you wanted). It took me a while to get around these problems and it was only with the addition of the the WiFi backpack that the camera really started to work for me. Back when I bought the GoPro there weren’t many alternatives in the action camera market – these days there are a growing number of competitor brands and, judging by the reviews I’ve read, the GoPros are under pressure to justify the premium price they currently command. If you’re in the market for an action camera I would do a Google search on ‘GoPro alternatives’ before you buy into the GoPro brand….that’s not to say that the GoPro is a bad choice, but rather that there are cheaper alternatives out there that might suit your needs just as well. Nevertheless, a GoPro is what I bought and it does have the benefit of being able to cope with the jungle environment which is, in itself, is a major plus for me as it means that I can now film on trips where in the past I could not. In the video below I show the ways I’ve got around the problems I encountered with the GoPro and, now that they are no longer an issue, the camera is performing well enough and the only outstanding issue is the poor video quality in low light situations. A new word I learnt the other day was ‘glamping‘ defined as a ‘a form of camping involving accommodation and facilities more luxurious that those associated with traditional camping’ (think large canvas, semi-premanent tents with running water, wifi, electricity and the like). There are some people who get a bit sniffy about this sort of camping, just as they do about those who use caravans or go camping next to their cars . I am not among this rather purist crowd and, as far as I’m concerned, as long as people practice a ‘leave no trace’ approach and have respect for others, then they can camp however they please and their experience of being out in nature is as valid as anyone else’s. These thoughts were going through my head on a recent trip I took up to Lake Temenggor. 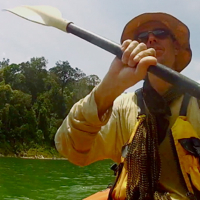 The lake itself is man made – a result of the Temanggor Dam – and another reminder that the environmental impact of governments and corporations far outweighs that of the jungle trekker who cuts the odd sapling or two to clear a path. In some ways kayaking reminded me of my days camping with the off-road crowd – with both a kayak and a 4×4 you can afford to carry far more weight with you and that opens the door to bringing along luxuries (an ice box full of beer!) that, were you forced to carry the load on your back, you would sensibly do without. 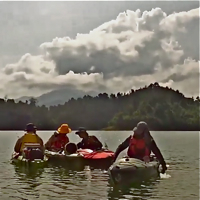 Also, in both cases you are are both enabled and tied to that mode of transport – you can travel further and don’t have to fight your way through the jungle but it’s also difficult to simply leave the kayak/4×4 somewhere and head off into the jungle for any length of time for fear that something will happen to the unattended kayak/4×4 while you’re away. And, with both off roading and kayaking there is a greater amount of pre-trip organisation required, you can’t simply pick up your pack and go where you please. Of course, the key difference between kayaking and off-roading is the environmental impact and it’s hard to imagine a mode of transport less damaging to the environment than a kayak (unfortunately the same can’t be said for off-roading). Also in a kayak you feel like you’re really out in nature whereas inside a vehicle it’s almost as if you’re cocooned from the outdoors and watching it through the TV-like-view of the windscreen. Oh, and kayaks are silent whereas 4x4s most certainly are not! There are certainly advantages in seeing the jungle by kayak vs jungle trekking – you get less dirty and sweaty, less scratched up by the rattan and thorns, there are less bugs and biting creatures to deal with, no slippy hills to clamber up or wild boar to worry about, no heavy pack slowly breaking your back either – and, at the end of the day, you still set up camp in the jungle and experience the sights and sounds of a night in the forest. For some reason, however, I have always liked to walk when in the outdoors and trekking is where my heart lies but, when I get too old and crickety to pick up my pack and walk over the next hill, then I think I’ll invest in a kayak. And when I’m too old to even paddle…. 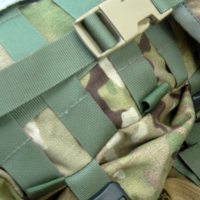 Recently I commissioned Ben from Garrison Packs to make a lumbar pack designed for the jungle and to own my particular specifications. Ben is producing packs to the same quality as the top backpack brands (some of which go for, frankly, ridiculously high prices) at a more affordable price and, best of all, he will customise packs to your own design – so, even though I already owned two lumbar packs, I couldn’t resist the chance to design one for myself. The lowered centre of gravity makes you more balanced on your feet. They snag less on overhead branches as you duck under them. Your upper body is unencumbered making it easier to twist and turn and to use a parang. Your back is left exposed so you don’t overheat as much. 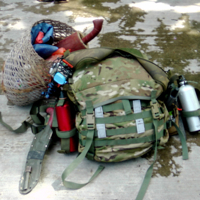 Rather than doing a straightforward review of the pack I thought it would be more helpful to look at the key differences between the traditional (Orang Asal) jungle backpack and the modern equivalent and try and draw out some general themes that might be of use when trying to select your own gear. Camping with a dog in the jungle is new territory for me and I thought it would be interesting to document the process. There are number of potential problems: wild animals are all around so the dog needs to be on a leash and may spend the whole night barking manically and also the rain and bugs can make your canine friend miserable. 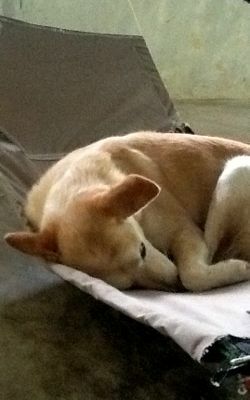 In a good camp spot with fair weather, shelter for the dog is not an issue – he can simply sleep beneath your hammock – but, as anyone who has spent time in the jungle will know – when it rains it pours and the ground beneath your hammock can quickly transform into a large puddle, possibly riddled with leeches that will turn your dogs’ paws into a bloody mess. This concept of a double decker hammock could also be used if you have a young child you want to take in camping and don’t feel confident with them sleeping too far away from you. The other thought in my mind was that this process – of gradually getting the dog accustomed to jungle camping and taking it step-by-step – is also a good approach for a newbie to the jungle to take. Rather than starting off your jungle experience by signing up for a hard-core, two week expedition deep into the heart of the jungle, it is a far better idea to start off with a single nights camping (maybe not far from your car) so that you can get used to your equipment and find out what works and what doesn’t.